West coast waterfront strike of 1934. Photo: Oregon Encyclopedia. 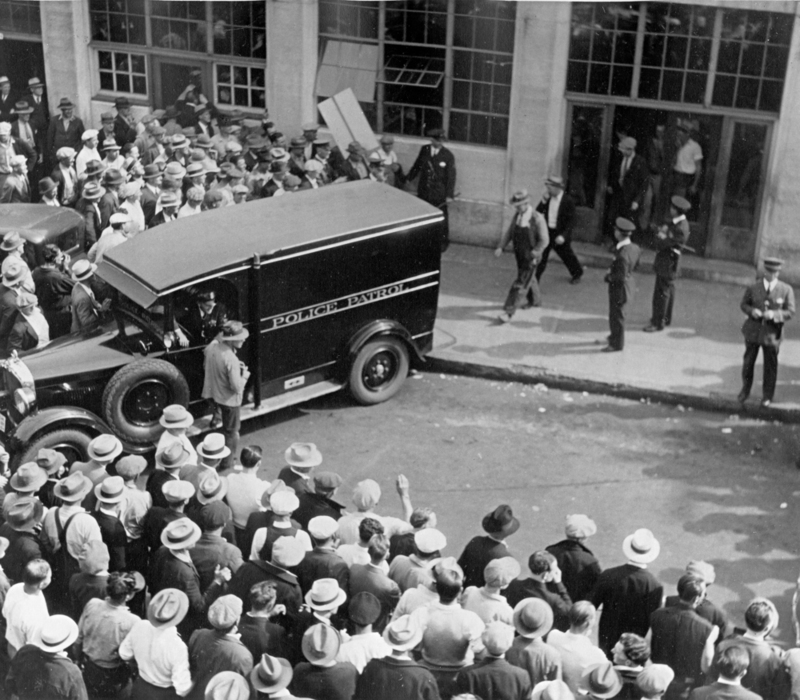 This lesson focuses on a key event in the labor renewal of the 1930s. The workers’ victory in the longshore strike gave a powerful impetus toward the revitalization of an existing union and toward organizing new ones. 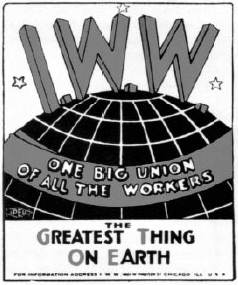 The union that eventually resulted, the International Longshore and Warehouse Union (ILWU), is still one of the more democratic in the United States. In the activity, students role-play an industry-wide strike that took place up and down the entire West Coast. 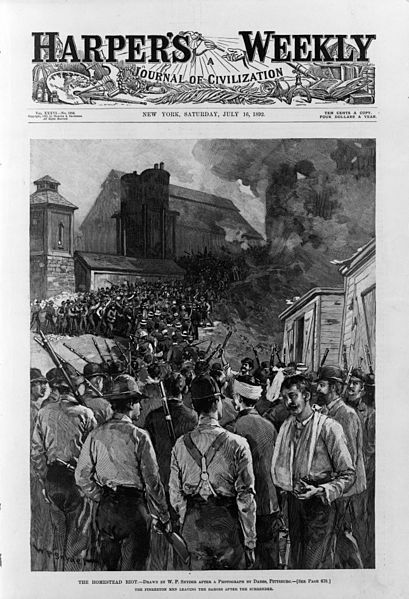 This story has most often been told from the standpoint of San Francisco, which was the hub of the strike. This lesson is set in Portland instead. In Portland, the importance of the ties built with other groups in the region, including farmers, is particularly clear. Role play on the 1912 Bread and Roses strike in Lawrence, Mass. Teaching Activity. By Bill Bigelow and Norm Diamond. 10 pages. 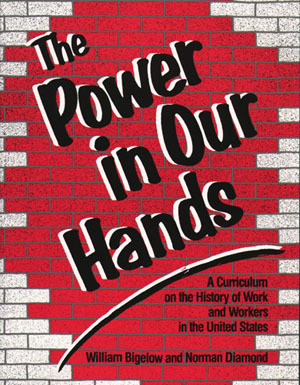 This role play activity on the famous 1892 Homestead Strike, explores the possibility of solidarity among workers of very different backgrounds and at different levels in the workplace hierarchy. My students killed it today participating in Bill Bigelow’s awesome role play reenacting the tensions in Portland during the 1934 West Coast Longshoremen strike. Here’s students’ (in the role of the longshoremen) opening speech: “As most of you know being a longshoremen isn’t by any means the most respected or sophisticated job. You have office chairs and we have barrels to sit on. You go to work everyday and we have no idea when we’re going to work or not. We’re twice as big as our bosses yet we get pushed around. That’s why we’re going on strike. We’re tired of being playthings for the Waterfront Employers. We want better working conditions. We want to regain out dignity. We want fair hiring and an increase in pay. 85 cents is not nearly enough for the loss of limbs, the stubbed toes, the jammed fingers and the body soreness we live with every day. We demand $1 an hour and a 6 hour day and 30 hour workweek. If you don’t want to give us that then move your own things.” This was followed up by another group of students representing the Central Labor Council pledging a general strike if I (Oregon Governor Meier) called in the National Guard and the groups representing the unemployed and farmers pledging their support for the Longshoremen.